Tourists take pictures at the entrance of Malaysia's National Palace in Kuala Lumpur, Jan. 23, 2019. Sultan Muhammad V, center, salutes after his welcome ceremony as he walks with Malaysian Prime Minister Najib Razak, right, at the Parliament House in Kuala Lumpur, Malaysia, Dec. 13, 2016. Sultan Abdullah, 59, was named the state's new ruler — replacing his elderly, ailing father — several days after Muhammad V's abdication, in a step viewed as paving the way for him to become the next national monarch. If he does not become king — he could refuse the post, or be deemed unsuitable — then the next in line for the throne is the powerful sultan of wealthy Johor state. Malaysia's sultans trace a lineage back to the Malay sultanates of the 15th century. 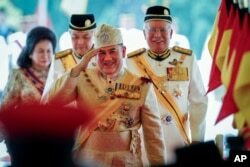 The king is referred to as Yang di-Pertuan Agong, or "He Who Is Made Lord."